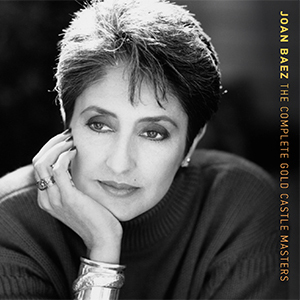 There was a moment in 1987, when a feisty and driven Joan Baez thought, “enough is enough.” She rolled up her sleeves and accepted an offer from artist manager and label executive Danny Goldberg to join his latest startup, Gold Castle, and start making records again. That decision led to three albums whose reappearance in 2016 should be cause for no small amount of rejoicing in Joan Baez circles, especially by those who might’ve been looking the other way (musically, most likely), or just missed them entirely the first time around. So quickly did they seem to come and go. The 30 collective tracks contained on Recently (originally released July 1987), Diamonds and Rust in the Bullring (recorded live in Bilbao, Spain, 1988, released April 1989), and Speaking of Dreams (November 1989) hold their own as some of the greatest song selection sequences of Joan’s entire discography. And that’s saying a lot, considering the scholarship and timeliness of material to be found on her (other) 30 or so principal career albums, studio and live. All three Gold Castle titles were produced by Alan Abrahams at Capitol Records Studios in Hollywood. The three albums, along with a few bonus tracks, make their re-appearance as The Complete Gold Castle Masters. Highlights from the studio albums, Recently and Speaking of Dreams include the Paul Simon collaboration, “Rambler Gambler/Whispering Bells” and a duet with Jackson Browne, “El Salvador”. The albums also contain some of Baez’s last songwriting contributions to her oeuvre, including the stunning title tracks of each. Diamonds and Rust in the Bullring, recorded live in Spain, contains a definitive version of Joan’s signature “Diamonds and Rust” as well as six songs from her Spanish repertoire.